Raspberry-Yogurt Cakes - Simply scrumptious: Easy, delicious and lovely to look at! 1 Combine 4 eggs, 50 grams (approximately 1/4 cup) of sugar and the salt in a bowl. Beat with a hand mixer until creamy. 2 Whisk the flour and grated coconut into the egg mixture. Line a baking sheet with parchment paper. 3 Spread the batter onto the prepared sheet and smooth with an offset spatula. Bake in preheated oven at 200°C (fan: 180°C, gas mark 3) (approximately 400°F) until golden brown and springy to the touch, 8-10 minutes. Let cool slightly in pan, then invert cake onto a wire rack and carefully remove parchment. Sprinkle cake with 1 teaspoon sugar and brush lightly with water. 4 With a cookie cutter (about 10 cm diameter) (approximately 4 inches in diameter), cut out 6 rounds from the cake, wrap in plastic wrap and set aside. 5 Soak the gelatin sheets in a bowl of cold water until softened, about 10 minutes. Separate the remaining eggs. Reserve whites. Beat yolks with 50 g (approximately 1/4 cup) of sugar in a bowl until fluffy with the hand mixter. In a saucepan, bring milk to a boil. Remove from heat and let cool slightly. Slowly add hot milk into yolk mixture, whisking constantly. 6 Heat the egg-milk mixture in a bowl over a hot water bath, stirringr constantly, until thickened and creamy. Remove from heat. Add the softened gelatin and stir until dissolved and thoroughly combined. Let the mixture cool for 5 minutes. 7 Rinse the lime in hot water, wipe dry and finely grate the zest. Squeeze juice from the lime and stir juice and zest into the gelatin mixture along with the yogurt. Chill in the refrigerator until it begins to set, about 45 minutes, stirring occasionally. 8 Set the rings molds on a baking sheet and place the cake rounds in the rings. Pick over the raspberries and gently rinse and dry if necessary. Reserve some for garnish. Place remaining raspberries, stem side down, on top of cake rounds. 9 Beat the egg whites with the remaining sugar until stiff. Whip the cream until stiff. First stir the whipped cream into the gelatin mixture, then gently fold in the beaten whites. Spread the gelatin mixture over the berries, smoothing with the spatula, and refrigerate until completely set, 2-3 hours. Remove cakes from the rings. 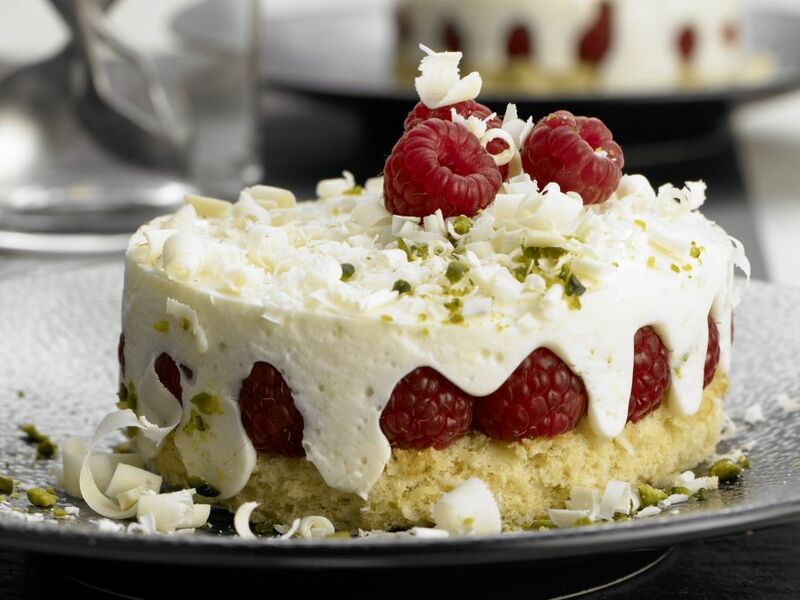 Garnish with reserved raspberries, grated white chocolate and chopped pistachios and serve immediately.